In this day and age, given the near endless list of powerful and inspiring DAWs, plug-ins and software instruments out there, there's absolutely no reason why you can't create great music entirely 'in the box'. Still, there's just something about working with hardware. While adding hardware to your computer-based set-up isn't going to magically make your music sound better instantly, it's amazing how much adding a few external audio processors can help to invigorate and focus your workflow. Check out this month's Hardware Processing cover to see what we mean. We've got a whole host of exciting new gear on our test bench this month too. Check out our verdict on Dave Smith's new monster of a monosynth, the Pro 2, Waldorf's esoteric new string synth, Streichfett, and Akai's revamped range of APC Ableton Live controllers. It's all accompanied by the usual wealth of audio demos on the disc and the Vault too. Finally, don't miss our special digital edition offer. If you buy a hard copy of this month's mag, you get a free Apple Newsstand or Google Play Store version of the issue at no extra charge, complete with all the usual downloads, videos and interactive features. 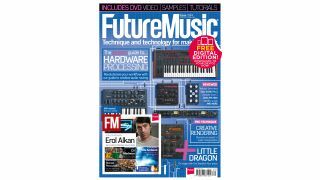 See inside the mag for details and start enjoying FM on your iOS or Android device today.